An MIT team is providing new understanding of the growing interconnections among three critical resources: energy, water, and food. The work focuses on Pakistan’s Indus Basin, where irrigation water is increasingly pumped from underground, a practice that is intensifying a preexisting shortage of energy. Using new and existing data plus statistical models, the researchers are clarifying how much pumping is going on, how it’s affecting energy use and food productivity, and where and why it’s happening in this region—home of the world’s largest contiguous network of river-fed irrigation canals. A dynamic model under development will enable decision makers to assess the long-term, interacting impacts on energy, water, and food of proposed infrastructure and policy initiatives, taking into account the possible long-term impacts of climate change on water management. Many researchers are examining the use of water in energy-related activities such as running power plants and extracting hydrocarbons. But less attention has focused on the growing consumption of energy to provide irrigation water for food production. Today, about 70% of all fresh water consumed worldwide is used for agriculture, and the use of irrigation continues to spread, pushing up crop yields from each hectare of land. But in recent decades, farmers in regions such as South Asia have begun pumping up groundwater rather than relying solely on water diverted from rivers and lakes. In some places, that practice is causing the water table to drop—a trend that is arousing much concern. Pumping also consumes energy, a commodity in short supply in some of the great food-producing regions of the world. 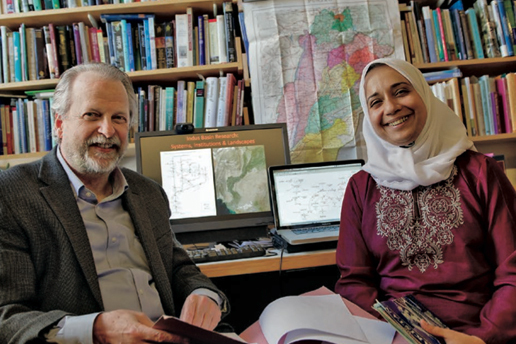 For the past two years, James Wescoat, Aga Khan Professor of Architecture, and Afreen Siddiqi, a research scientist in MIT’s Engineering Systems Division, have been examining the connections among energy, water, and food. Their work focuses on the Indus Basin in Pakistan, a region where those connections are acute and all three resources are in short supply. This arid region depends critically on the Indus River, which delivers water from snowmelt in the high Hindu Kush-Karakoram-Himalayan mountains and Tibetan Plateau to the plains of India and Pakistan. In Pakistan, a complex network of canals—built by the British starting in the mid-19th century and expanded in the 1960s and 1970s—spreads water from the Indus and its tributaries over some 44 million acres of farmland. Despite access to this enormous irrigation system, farmers in the Indus Basin are increasingly using “tubewells” to get the water they need. They bore stainless steel pipes into the underground aquifer and withdraw water using diesel- or electric-powered pumps. This trend, coupled with a broader shortfall in energy in Pakistan, has now turned into an acute problem. “So irrigation is not just about water; it’s not just about agriculture. It’s become intimately connected with energy and therefore greenhouse gas emissions as well,” says Siddiqi. Much is known about water resources and agricultural development in the Indus Basin. Half a century of intensive study has yielded extensive data and a succession of water-resources models—some more sophisticated than many used in US river basin planning, according to Wescoat. But the energy component has received relatively little attention—a gap that Wescoat and Siddiqi are working to fill. Their efforts could have significant real-world impacts. Planning is now under way in the Indus for multibillion-dollar projects for canal upgrades, novel irrigation systems, and new reservoirs and hydropower plants. In addition, institutions are in flux, with restructuring and reorganization already taking place. It’s critical that decision makers examine the impacts of such changes on all three factors—energy, water, and food—to avoid unintended consequences that could result from giving short shrift to any one factor or to their interactions. To address the energy-water-food “nexus,” Wescoat and Siddiqi have been collecting, compiling, and analyzing data and formulating initial quantitative models that are helping them understand what’s going on and why. Their first task was to establish the extent of the pumping system in the Punjab Province, which makes up a significant part of the Indus Basin. The figure below shows a sustained, almost exponential growth in tubewell use over more than three decades. Between 1987 and 2007, for example, the total number of installed wells went from about 230,000 to almost 900,000. That surge was followed by a slight slowdown in recent years. Most of the growth has been in diesel-powered pumps. The number of wells with electric-powered pumps has increased only slightly. 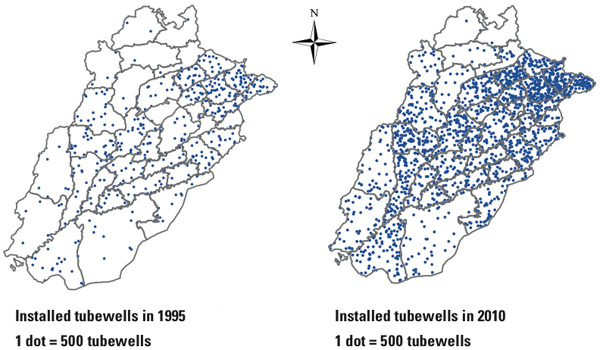 The maps below show the geographical distribution of tubewells in the Punjab in 1995 and in 2010, with each dot equal to 500 tubewells. The maps, generated with assistance from Emma Broderick ’14 of chemical engineering, demonstrate not only the increase in installations over 15 years but also the variation in density in different parts of the Punjab. 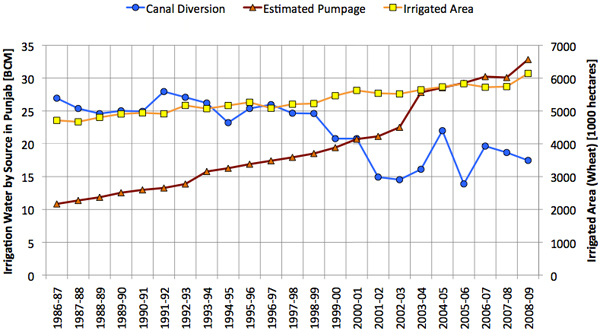 As the use of tubewells has been expanding, deliveries from the surface canals have been declining. Over the past several decades, the supply of canal water in winter—the season when the important wheat crop is sown—has dropped on average by 0.5 billion cubic meters each year. Today, one contributor to reduced flow is delivery losses: Some 40%-60% of water in the canals simply seeps into the ground. To illustrate those trends, the chart below shows amounts of water supplied by the canal system and by tubewells for the irrigation of wheat, a major crop in the Indus Basin and a staple food for the region. Over the last two decades, the total amount of irrigated land devoted to wheat—shown by the yellow curve—has steadily increased. The blue curve shows the amount of water coming via the surface canals, the red curve the amount pumped out of tubewells, pumping flow rate, and average operation time). The decrease in surface water supplies and the simultaneous increase in the use of pumped water are striking. Those trends suggest that the pumped supply is making up for the missing surface water—and in fact it is. The surface system is increasingly serving as a distribution system for recharging groundwater in the region. In effect, the aquifer is becoming a huge underground storage system for the Indus water—and it must be accessed using pumps. “So the pumping system is serving as a bridge to make up for supplies that were traditionally provided by the gravity-fed canal network,” says Siddiqi. The growing dependence on tubewells is providing several benefits, notes Siddiqi. One is that farmers can get water whenever they want to. Farmers who rely on canal deliveries must wait for a controlled release of water into their section of the irrigation network. In contrast, farmers with tubewells can withdraw water whenever they want to and at the quantities they need (depending on local availability). That benefit is significant, given the shrinking canal deliveries. But a far greater advantage is that the availability of tubewells ensures continued irrigation, and more irrigation means more food production. The figure below, compiled with assistance from Lina Kara’In ’15 of architecture, quantifies that effect for wheat in the Indus. The gray curve tracks the expanding production of wheat from irrigated land—from just under 8 million tonnes in 1986 to almost 18 million tonnes in 2009. The other two curves show yield, that is, the amount of wheat produced per hectare of cultivated land. The yield in areas dependent on rainfall—the green curve—shows annual oscillations as precipitation varies, but over time it remains roughly constant. 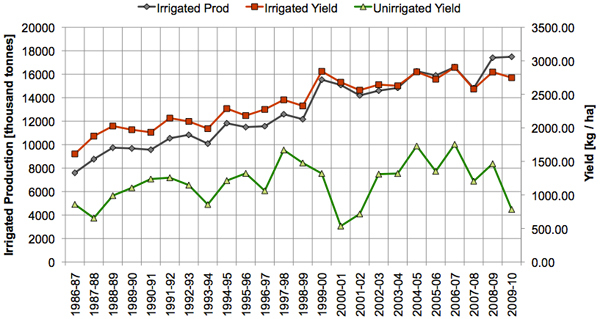 In contrast, yield from irrigated land—the red curve—shows a distinctly upward trend, with a 75% increase between 1987 and 2010. While pumping is helping to push up food productivity, it is also causing energy-related problems. For farmers using diesel-powered pumps, the cost of fuel has become a burden. The price of light diesel oil in Pakistan has been rising almost nonstop since 2001, and in just the last three years it has gone from 60 rupees/liter to over 90 rupees/liter (1 US dollar = 95 rupees). That price— along with increases in taxes on petroleum products—may explain the recent slowdown in the installation of new tubewells. “Those are very significant costs that have begun to materialize in food production—and they didn’t exist a few decades ago, when the gravity-fed canal system was providing the bulk of the water,” says Siddiqi. 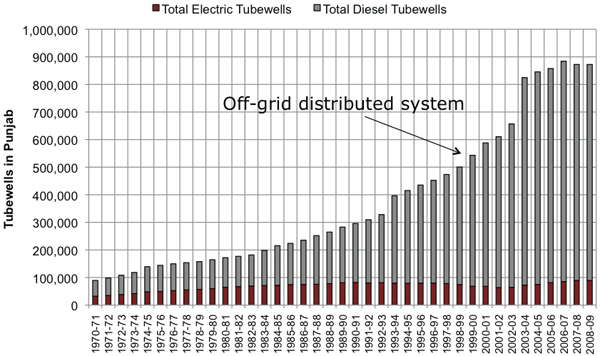 From the national perspective, tubewell pumping is also straining the electric power grid. Although diesel-driven pumps predominate, some areas do have many electric-powered pumps, and in places, their electricity consumption is high enough to rival industrial use. Indeed, some factories as well as farms have had to shut down because of power shortages. While there is no control of privately owned diesel-powered systems, here the national power grid has influence because it can decide how much electricity it makes available to customers. But grid operators must make a difficult choice: How do we allocate our power among agriculture, industry, and cities? The tight links between energy and water in agriculture underscore the importance of co-planning and co-managing these critical resources—a goal that is easy to comprehend but hard to achieve. For one thing, energy and water are often regulated by separate entities that make independent decisions. But even with appropriate institutional reform, policymakers, planners, and operators need help understanding and quantifying the integrated energy, water, and food implications of planning and policy options. To that end, Wescoat and Siddiqi are developing a model based on system dynamics, a technique used to simulate the behavior of complex systems as they evolve over time. The framework of their model includes quantitative descriptions of dozens of elements in the energy-water-food system as well as interactions among them. Key variables include cultivated area, crop production, irrigation requirement, and energy demand for pumping. Values for those variables are determined by interactions among an array of factors such as technical details of the pumps, depth of the local water table, water needs of specific crops, fertilizer use, and more. Given values for external factors such as population, oil price, and market prices of other commodities, the model will perform sequential calculations, on a seasonal time scale, and thereby track quantities and flows of energy, water, agricultural products, and other elements throughout the system. Such analyses will enable planners to assess long-term food security—a critical policy issue—as it may be impacted by supplies of water and energy in the region. A final component is the effect of climate change on future water availability—a major concern in this area. A high fraction of the Indus Basin is covered by snowfields and glaciers. If climate change causes those snow and ice resources to change—as the ice in the Arctic is doing—the long-term impacts on the melt water feeding into the Indus River could be dramatic. The model’s calculations will take into account the impacts of such uncertainties on the range of probable outcomes. Once the model is fully implemented, Wescoat and Siddiqi will use it to examine a series of “what if” scenarios. For example, what would happen to energy and water use and food production if new sprinkler or drip irrigation technologies are adopted? What would happen if micro-hydro or solar power systems are installed? And what would happen if changes in prices, taxes, or policies cause farmers to grow different crops—perhaps ones that require significantly more or less water? 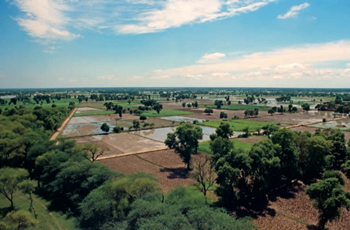 The ability to answer such questions may lead to innovative irrigation approaches in the Indus Basin and elsewhere that could create more efficient use of both energy and water, helping to ensure the future availability of those critical resources while increasing crop production and food security for people worldwide. A. Siddiqi and J. Wescoat. Energy and Water Linkages for Agricultural Productivity in the Indus Basin. Presented at the Global Water System Project international conference— Water in the Anthropocene: Challenges for Science and Governance, May 21–24, 2013, Bonn, Germany.